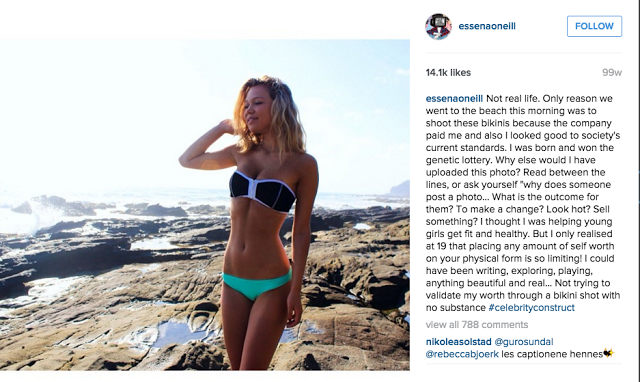 For someone who has quit social media, Essena O'Neill's name seems to be all over it. Earlier this week, the social media influencer deactivated her Snapchat and Tumblr accounts. She also deleted most of the pictures on her Instagram account which had almost 700,000 followers, leaving a few with edited captions and renaming her account 'Social Media Is Not Real'. She has since deactivated her entire account alongside her popular YouTube channel with around 250,000 subscribers in a protest against the influence of social media. I have followed Essena on social media since earlier this year. I loved her bright and colourful photos and how passionate she was about issues close to her heart. I was so inspired when I saw the edits of her photos as part of her 'Behind the image' campaign that gave an inside look at the ugly side of so-called 'Instafame'. I admired her courage in getting vulnerable so that young girls would stop aspiring to the often staged images that they see of social media influencers. I am 100% in support of what she is doing and completely admire her brave stance on social media comparison. However, as I watched some of her videos and read some more of her online content, I got the impression that she was putting all users of social media into this box of being follower-craving, like-obsessed and fake. I understand that this was her experience, but I don't think it is fair to generalise intentions of all users based on that! For me, I use social media on a daily basis and in all honesty... I am okay with that! Earlier this year, I moved from Sydney to Auckland so social media has played a massive part in me being able to keep in touch with friends and family both there and around the world. Sure I could write a hand written letter, seal it with a kiss and put it in the post - but honestly, who has time for that! It is a nice idea and maybe I'll do it one day but the instantaneous nature of social media means that I can message loved ones whenever and wherever. Even if I am not messaging people, I still love being able to scroll through my newsfeed and see what they are up to. I love that I can see my grandpa's updates while he is traveling Europe or Nigeria despite the differences in time zones. Seeing my Mum's posts always make my day! She doesn't need to call me and tell me every small detail of her life, but through social media I can still laugh with her about all the crazy things that she is up to, like the time she took a selfie whilst sitting in dog poo, or the time someone left this on her windscreen! If you are born after the year 1993, you are a part of what is known as 'the google generation'- a generation that has always known the existence of the internet. Gone are the days of libraries and encyclopaedias, we can now pull up thousands of results in a fraction of a second with the click of a button. The internet has made so much information so readily available. I love that through social media I am able to access some of the knowledge, thoughts and opinions of others that contributes to my own learning and understanding of the world. I love reading articles that people share on social media that challenge my perspective on certain issues or inform me of topics that I would otherwise be oblivious to. I even rely on social media for little things, frequently YouTubing questions such as "How to fix a broken zipper" or "How to apply liquid eyeliner". Through social media I can share and discover cool places, people and events that I otherwise wouldn't know about. Also if it wasn't for social media I would be completely unaware of the existence of s'mores dip... its life changing! Get on that stuff! Whatever you are interested in, it is guaranteed that on the internet, there will be people talking about it! Social media is a great place to connect with people who have the same passions and interests as you. Whilst some of your friends probably don't want to hear you ramble about Twilight Fan Fiction or your extensive collection of limited edition Star Wars merchandise, there will be people online who do! Your online profile and "personal brand" as it can be described, is your way of saying to the world "Hey, this is who I am, what I do, what I like and what I stand for". The world needs a little bit of YOU and through social media you can impart your voice, style, opinions and creativity. Yes, it is true that you can be selective with what you post and only show staged moments of your life of the highlights. Ultimately it is up to you to determine how you want others to form impressions of you based on what you post. Although I think Essena was brave in sharing her vulnerabilities online, not everyone will choose to do the same and that is perfectly okay! I know it is a massive waste of time but I LOVE scrolling through old social media posts. Not only do I love revisiting fond memories, I also love looking at things that I once posted or sent and thinking "Wow, I am glad that I have grown as a person since that happened". I also find so much entertainment in laughing at updates made by 12 year old Ella wHerRE I wEnT ThrOuGH a PhASe OF TyIng LIKe Di$ aaaaannnndddd eeeeevveeennnn liiiikkkeee thiiiiissss. I even posted Facebook updates saying "is going to school" or "is happy".... To anyone that was my friend back then, I sincerely apologise for wasting your time! I love that Facebook has started bringing up memories, A year ago today I was enjoying my newly found freedom after officially finishing school and completely finishing my HSC exams. So much has changed since then and I love looking back on the times that have shaped what I am doing now and who I am today. Social media is a great tool for standing up for what you believe in and bringing to light issues that need to be addressed in our society. From human trafficking to child poverty, it is important that these issues are out in the open so that people are informed and empowered to act and stand up against them and make a change. SO WHEN DOES SOCIAL MEDIA GET DANGEROUS?? Yep. I'm exceedingly guilty of this! I sometimes scroll away hours of time that could have otherwise been used productively! I am aware of this issue and Essena's whole campaign has really challenged me in this area. I want to be spending LESS time on social media as opposed to removing it from my life all together. Girls are naturally wired to compare and it is so easy to look at someone else's Instagram and think "I wish I looked like her" or "I wish I had her life, it seems so perfect". My mum once gave me this piece of advice that really stuck. She said "Don't compare your behind the scenes to somebody else's highlights reel". Don't compare what is going on in your life to the way that somebody PORTRAYS their life on social media. It is not an accurate representation as it most probably leaves out the hurts, insecurities and challenges that they too are dealing with. Through her 'Behind the Image' campaign, Essena has effectively highlighted ugliness that can be hidden behind a beautiful face and a fake smile. It is equally as important however, to acknowledge that the stories behind pictures are never the same, the subject might genuinely happy, surrounded by people who are truly their friends making memories and enjoying life. Regardless, we shouldn't be comparing our lives to the photo-depictions we see of the lives of others but instead focus our time and energy on making the most with what we DO have. I feel like I'm talking about my mum a whole lot in this post but she just seems to be a fountain of wisdom when it comes to the area of social media! She has imparted in me since my early teenage years that "Facebook is not a trusted friend". Whilst it is perfectly okay to be real on social media, to talk about things in your life that maybe aren't so perfect, some things just cross the line. Social media is no place to bring up things that, well... just really shouldn't be brought up. I was insanely disgusted by a post I read on Facebook that a girl put up for her 6 month anniversary with her boyfriend, talking about their disgusting habits and peeing in the shower... TOO FAR! I wish I could have unread that, some things are best kept private! I'm not trying to tell you what you can and can't post, everyone will draw the line in a different place. I am, however, encouraging you to think before you post paragraphs that would be better told to a counsellor than your 1000 Facebook friends! Cyberbullying is a massive problem within this generation. Keyboard warriors, anonymous haters and trolls take every chance to spread hate. How can you ever feel good about yourself if you are purposefully bringing others down? Once you have posted something online, it is out there for the world to see. There is no taking it back. These days, things can be screenshotted and spread at the blink of an eyelid. It is okay to disagree with someone or have a different opinion to them but that is NEVER an excuse for a personal attack. Recently, I have been pulled up by some people that are close to me about some photos that I chose to put on social media. I won't go into excessive detail about the photos and what not, but I'll just say that although my intention in posting them was completely innocent, the way they were received may not have been. Although I had a clean conscious knowing that I hadn't done anything that was against what I believe, photos can be interpreted differently to how they are intended. Some things just aren't meant to be posted on social media, I learnt that the hard way! This really relates back to what I was saying in the last point about the fine line between what is public and what is private information. Now before I post things I will consider the potential people that will see it, that could be anyone from close friends to potential employers, and I will ask myself whether or not I am conveying myself in a way that is in line with what I stand for. Stop. Think. Why am I posting this? What kind of reaction am I trying to get from those that will see it? It is okay to use social media to express your identity but it never should become your source of identity. Never seek validation through the amount of activity on your social media page. Always remember that you are far more beautiful than that selfie you just posted because it can't completely capture the inner beauty and untapped potential that is inside you. You are worth so so so much more than the number of followers you have! Read Essena's post 'Liked' for her journey through this desire for approval online. I think that overall, Essena has raised some serious points about the potential misuses of social media and has definitely got people talking on the matter. I believe that social media CAN definitely be dangerous but with the right intentions, it can also be used in positive ways. We are living in a changing world and really, we are the guinea pigs for this kind of technology - no other generations have tried it before us. We are all learning and we are all only human.